The Protagonist: Myfanwy Thomas. Possessed of paranormal body-altering powers, she works as a "Rook" for the Chequy - a secret organization bent on keeping Britain safe from magical threats. Her Angst: This Myfanwy Thomas has absolutely no memory of who she is or was - thanks to a betrayal from someone in the Chequy. Is she capable of impersonating, well, herself, to find out who put a hit out on her? Heretic: A friendly member of the Chequy court (Chevalier, to be exact) who can contort himself into impossible shapes. Gestalt: Myfanwy's fellow Rook, who is a single soul born into four bodies and can operate each one independently and simultaneously. Not the easiest person to relate to. Lady Farrier: The Lady of the Chequy, who can enter and control people through their dreams. She is the only one who knows of Myfanwy's amnesia, and she keeps it quiet to settle an old debt. Grantchester: A Bishop of the Chequy who can emit gaseous chemicals from his pores. A swinging ladies' man and diplomat. Alrich: The Chequy's other Bishop, who can only come out after sundown, is ridiculously gorgeous, and doesn't age. He's pretty much exactly what you think he is. Eckhart: A former soldier who discovered his abilities in adulthood, he's a Chevalier of the Chequy and capable of manipulating metal into different forms. Shantay: A Bishop from Croatoan (the US version of the Chequy), who can turn her body into metal and becomes an instant BFF with Myfanwy. The Word: Reading has always been pleasant for me, but there have occasionally been times where, while I've enjoyed and appreciated what I've read, nothing has really connected with me in a way that makes me want to remember it and read it again and again. I'm kind of grateful for my recent change of reviewing policy (i.e deciding to review only books that I've loved or hated - no more wasting time reviewing "blah" or "m'eh" books) because, well, there have been a lot of "m'eh" books lately. Most of them have been decent, but none of them really "grabbed" me. I miss being grabbed by books. So it's always a pleasure to read something that absolutely abducts me from normal life so quickly and completely as Daniel O'Malley's The Rook. At the start of the book, our heroine opens her eyes and finds herself surrounded by dead bodies wearing latex gloves. She has absolutely no memory of who she is. The only clue comes from two envelopes in the pocket of her coat, addressed to her and signed by - herself. As it turns out, her name is Myfanwy (pronounced "Miffany") Thomas, someone stole her memories deliberately, and her previous self knew it was going to happen and prepared accordingly. As the new Myfanwy learns in the letters, she has two choices: she can go to the bank and open safety deposit box number one and find the money and instructions necessary to live the rest of her life anonymously and in comfort. Or she can open safety deposit box number two, find out more about who her body used to belong to, and impersonate the old Myfanwy long enough to find out who put a hit out on her. After encountering more murderous glove-wearing goons and eliminating them with her just-discovered paranormal powers, Myfanwy chooses Box Number Two. And discovers the old Myfanwy belonged to a secret organization of super-powered people dedicated to protecting Britain from supernatural threats. Oh, and someone within that organization (known as the Chequy) betrayed her. Neither Myfanwy knows who. Less awesome. There is seriously so much to love about this book that I almost don't know where to start. Actually - let's start with Myfanwy. Both Myfanwys. Old Myfanwy leaves New Myfanwy a suitcase full of letters explaining her life, the people around her, and the inner working of the Chequy. Old Myfanwy's voice is still very much present in New Myfanwy's life - even if they don't always agree. Old Myfanwy was taken from her parents by the Chequy the moment her powers manifested - and developed serious issues as a result. She was extremely shy, preferred administration to fieldwork, hated using her powers, and was generally looked down upon by the rest of the Chequy as a disappointment. Thanks to New Myfanwy having no memories of old experiences, she doesn't have the same anxieties and fears - and develops into a far more active, take-charge character, to the astonishment of her coworkers. The interplay between Old and New Myfanwy is fascinating and an excellent examination of how environment and experience can shape a person's personality. But then there's also the super-secret, super-rich organization of the Chequy with its near infinite resources and the many talents of its employees. Myfanwy is an administrator, which gives her a detailed and hilarious point of view into how everything works - yes, we get the cool details about brute squads and incident containment, but we also get all the red tape, bureaucracy and other highly entertaining mundanities of running a super-secret superhero organization. So there's a lot of action and gruesome deaths - but also a lot of everyday problems like dealing with snarky rookies and awkward Christmas parties. The balance between the mundane and the absurd, the human and the superhuman, is perfect. O'Malley never falls back on the stereotypical "super-strength, flight, invisibility" standard powers for the Chequy folks, either, instead going for the weird and interesting. My favourites are Myfanwy's ability to alter the bodily functions of others and Gestalt's ability to share a single mind and identity among four siblings. While this novel can be found in the Fantasy section of your bookstore, this book succeeds by refusing to restrict itself to any one genre. It's got action - but also mystery, with the suspense of an impersonation thriller as Myfanwy struggles to fit in without revealing her amnesia. It's got hilariously awkward office humour, along with supernatural creatures, a dash of political commentary and a skinless Belgian in a fish tank. 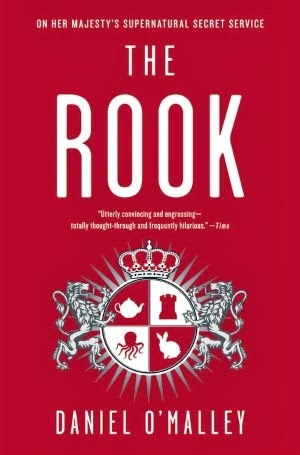 The Rook is pretty much an all-you-can-eat literary buffet and I encourage you to dive in, face-first. When I started reading your review I was worried you were going to trash this one and I'm so glad you didn't! Because it is indeed super awesome and was one my favorite books read last year. In addition to all the great things you point out above, I think the book did one of the better jobs of revealing the world and setting through the narrator being an amnesiac and therefore in the same knowledge place as the reader. The interplay between the two Myfanwy's is also a highlight and it is one reason that while I'm super excited for it, I am also a little nervous about book two in the series. Some of the things that worked so well here will be more difficult to carry forward into a series. True, but now their might be more interesting people who show up! Even if this book were a standalone, I would love it. SO good. SO SO SO good. Wish there was a miniseries based on it or something because that would be awesome! A miniseries would be BRILLIANT! And I agree - I would've been perfectly satisfied if this were a standalone. Won't stop me from being excited about another book in this 'verse though!